You might be trying to save time. You might be trying to save money. Or you might be in the middle of a holiday baking frenzy and need a substitute so you can just get on with the recipe! Besides that, the hallmark of an excellent (and frugal) cook is the ability to work with what you have on hand. 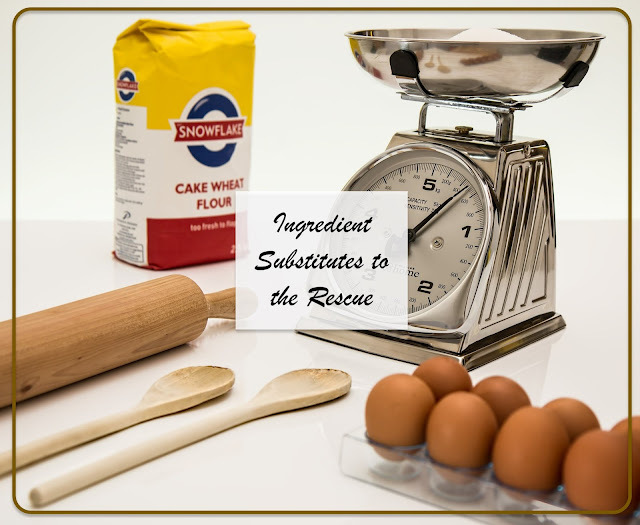 Before you run out to the store, try these substitutes. You might be surprised at how well they work! 1 cup sugar - 3/4 cup honey, 1 cup granulated sucralose, 1 cup granulate stevia such as stevia in the Raw. In my opinion, baked recipes taste better with sucrolose vs. stevia. A lot of stevia can leave a bitter aftertaste. 1 cup brown sugar - 1 cup white sugar plus 1 tablespoon molasses. Or in a pinch plain old white sugar will do just fine. It will change the flavor, but not in a way that ruins the recipe. I have also subbed turbinado (Sugar in the Raw) and that is a great option as well. 1 cup vegetable oil - 1 cup regular (not virgin) olive oil, canola oil or peanut oil or 1 cup applesauce or 1 cup pumpkin or 1 cup prune puree. I have excellent luck with subbing extra pumpkin in pumpkin bread and leaving out the oil. 1 cup shortening - 1 cup coconut oil (not virgin unless you want a coconut flavor). I actually prefer coconut oil, the expeller pressed variety, in certain recipes. There is a chocolate chip cookie recipe my mom made for years with shortening and when I tried it with coconut oil I liked it even better. 1 cup butter - Butter has a signature flavor and fat profile that makes things just so. Switching this ingredient with substitutes will definitely work, but your end results will just be different. In chocolate chip cookies you can use coconut oil (I prefer flavorless expeller pressed) or margarine. In cakes you can even sub in oil. The end product will be tasty, the texture will just change. Changing fat for fat usually works just fine. 1 teaspoon vanilla - 1 teaspoon extract of choice (this will change the flavor). Imitation vanilla extract will also work just fine. Some rather particular foodies might disagree, but I say it's no big deal. 1 egg - 1 tablespoon flax meal plus 3 tablespoons water. Let sit 5 minutes before using. This is good in recipes such as quick breads, pancakes, etc. It will not do when egg is a main ingredient such as in quiche (imagine a flax pie, ick!). I have had good results with quick breads such as this banana bread. 1 cup white flour - You can try subbing in different flours if you have them on hand. I prefer unbleached white flour, so I most times sub that in. You can also sub in whole wheat or white whole wheat quite easily. Whole wheat flour tends to require more liquid in the recipe, so keep that in mind if you use this as a substitute. I find great luck doing half white flour and half whole wheat flour without any other changes to the recipe. It adds some whole grain without anyone really noticing. Baking soda/powder - Read this article. It can be done! Green onions - Though the recipe won't be exact, any onion will work. In a pinch you can even use a little onion powder or re-hydrate dried onions. Chicken - Easily sub in turkey and sometimes even pork. Ground Beef - Any ground meat such as turkey, chicken or pork will work. Ground meatless crumbles can also be used. Cream of anything soup - Follow the recipe on this site or on this site. You probably have all the ingredients on hand. Are there any ingredient substitutes you are looking for? Did I miss anything? Let me know in the comments below. And thanks for stopping by!